I can’t be the only one who doesn’t feel like toiling away in the kitchen on Tuesday nights. (And often Wednesdays and Thursdays, too.) …Right? Time just seems to be in short supply on weeknights. And while there’s often groceries to buy, chores to do, and house projects to take on, we try to reserve at least one of our mid-week evenings for some relaxing together-time—usually popping in a movie. But that doesn’t mean we want to skimp on supper! Tyson® products are my go-to solution for a night in. Craving breakfast for dinner? Jimmy Dean® Hot and Spicy Sausage Biscuits with a side of bacon and veggie stuffed hash browns are ready in a snap so we can settle in with orange juice screwdrivers and an action-packed flick. Sometimes, we just want to forget about our grownup jobs and feel like kids again. 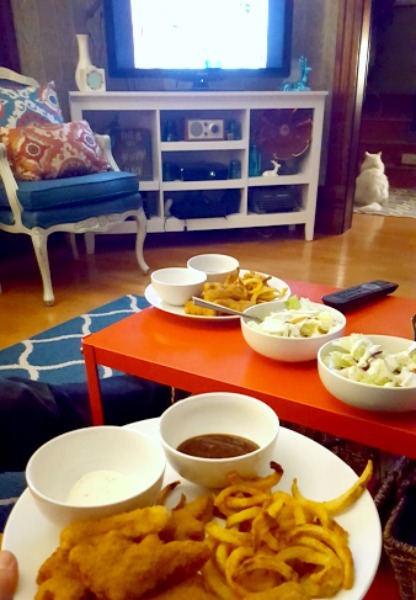 So you’ll catch us dipping our State Fair® Classic Mini Corn Dogs or dinosaur-shaped Tyson Chicken Fun Nuggets in ranch dressing (it’s an Iowa thing) while we catch the latest colorful cartoon. Tyson Foods just helps make weeknights easier. Their products are tasty and wholesome—saving me on time and effort without skimping on flavor. 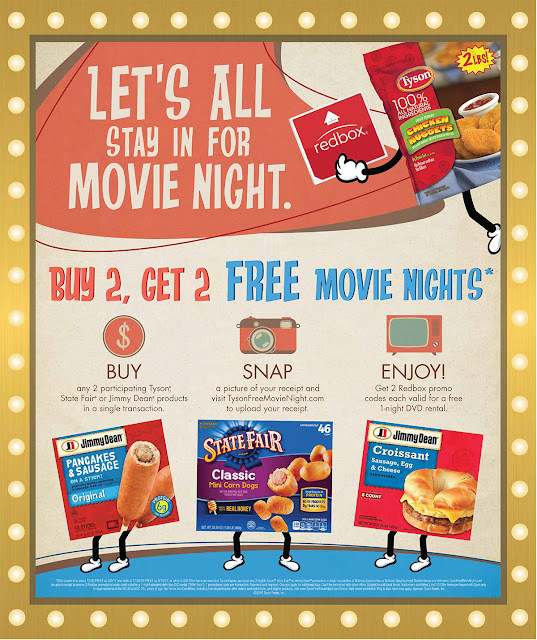 And right now, you can host yourself a movie night, too, courtesy of Tyson Products ‘Winter to Go’ offer with Redbox. Snap a picture of your receipt and visit TysonFreeMovieNight.com to upload it. Start planning your free movie night! You’ll get two Redbox promo codes each valid for a free 1-night DVD rental. Click here to learn more about claiming your #TysonFreeMovieNight. Details: *1 promotional code per transaction. Payment card required. Charges apply for additional days. Can’t be combined with other offers. Subject to additional terms. Void where prohibited.